You'll have to dance the night away with Tony Manero in this disco dancing game. Click here to play! If you can win the dance off, you'll be collecting top prize! It's Saturday Night at the dance club, so you'll want to spin as many Saturday Night Fever symbols as you can. They act as a wild symbol. They will only appear on selected reels, but will substitute for all other symbols, excluding scatters. They will also double prizes if they appear in a winning combination. You'll be taking to the dance floor to win a little money in this game. Spin one to five of the prize money symbols and you'll get up to 2500 times your line bet. Tony's medallion will also pay out. Two to five of these on a pay line will get you up to 1000 times your line bet. Tony's suit will also bring in wins as well as free spins if you can spin each icon in selected reels. Also watch out for disco balls, records, hair dryers, combs and cologne bottles. You could get up to 150 times your line bet. first prize that is. This trophy acts as a scatter. Two to five of them on an active pay line will multiply your total bet. It will also trigger a bonus feature in which you will dance for a chance to win even more cash. Put on the platforms and your best dress to dance the night away for a chance at top prize money in Saturday Night Fever! The first place trophy acts as a scatter. Spin two or more on an active pay line and you'll get up to 100 times your total bet. Three or more will also trigger a bonus feature. Tony's suit will trigger free games. 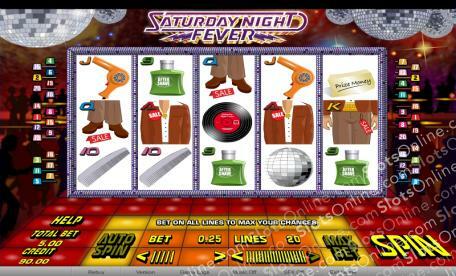 If you spin the jacket on reel 1, the pants on reel 3 and the shoes on reel 5, you will get a number of free spins. The Saturday Night Fever symbol acts as a substitute. It only appears on reels 2, 3 and 4 but will replace all other symbols, excluding the scatters. It will also double prizes if it makes an appearance. The Trophy symbol will trigger the Saturday Night Bonus if you spin three or more from right to left or left to right, including reel 1 or 5. During this feature you will be prompted to select from three boxes to conduct a dance. If you choose a right footprint and a left footprint, your dancer will do his dance and you will advance. If you choose two right or two left, you will end the game. There are six rounds and you can win up to 64 times your bet.